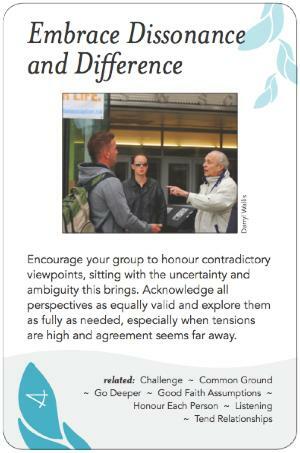 Encourage your group to honour contradictory viewpoints, sitting with the uncertainty and ambiguity this brings. Acknowledge all perspectives as equally valid and explore them as fully as needed, especially when tensions are high and agreement seems far away. stressful circumstances or sense of urgency. Facilitators need to be alert for situations and environments in which these circumstances are to be expected, and alert when they actually arise, both overtly and subtly (as evidenced by body language, unequal participation, raised voices, etc.). When such disturbances do arise, part of what a group needs is to be reassured that it's ok and a natural part of the process. Jerry Michalski is a master of holding differences. He uses Quaker techniques (e.g. silences when differences become too emotional), and intervenes frequently in discussions whenever there is unfairness, lack of clarity, power politics or over-emotionalism, naming the cause of the tension and suggesting ways to resolve it without glossing over essential differences. In this way he is able to encourage differences and dissonances, often several at once in a group discussion, while actively teaching participants how to appreciate and help hold open space for these differences.